strengthen the support to the rest of your body! Ankle exercises are either ignored or overdone. Ignored by the highly motivated because they seem so easy and unrelated to hip and knee rehab. Overdone by the poorly motivated because they are easy to those wanting to avoid pain and the difficult work of knee and hip rehab. No matter what category you fall into, they are some of the best leg exercises you can do. After all, your feet are what carry you if you want to walk again. They need to remember how to work in harmony again after surgery or having been laid up for some time. Good ankle range of motion and strength will determine how much the rest of your body can subconsciously relax or how much it needs to constantly be on guard to catch you when that weak ankle twists. Always check with your doctor before starting new exercises. Perform these exercises through your full, available range of motion - this way the muscles strengthen through the entire range, not just a part of that range. Slow and controlled is the key - and can help you slow down in a rat race society. These should be done gently at first - get a feel for what the exercise feels like. Focus on QUALITY vs. QUANTITY when doing any exercise. Follow any precautions your doctor may have given you. Pain can inhibit progress, a tennis ball can give you great relief! Ankle Pumps include pulling your toes and ankle towards your knee and then pointing your toes and ankle in the opposite direction towards the floor. Windshield Wipers involve turning your ankles from side to side (as shown in the video) - like windshield wipers on a car. 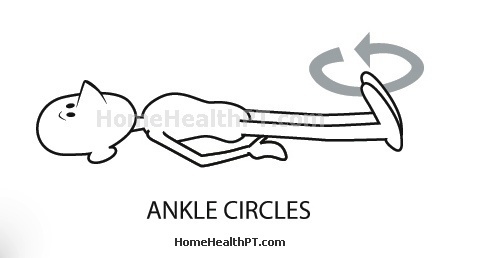 Ankle Circles involve move our entire ankle through it's full, available range of motion as if trying to sweep every number on a clock. As menial as these exercises may seem, they are what carry you from place to place in this world! Take the time to brush up on these in home exercises that are so simple (or maybe not!) to do. Even without surgery, they are one of the best exercises for elderly folks to do as ankles tend to tighten up as we age and tight ankles lead to more falls.